A migraine is a primary headache disorder that causes severe throbbing or pulsating pain, usually localized to one side of the head. What makes migraine headaches outstanding are the accompanying symptoms of nausea, vomiting, inability to tolerate light, speech difficulties and sensitivity to sound or smell. Migraine attacks cause severe debilitating pain that can last for hours to days and interferes with the normal day-to-day activities of the person. The pain generally gets worsened by physical activity and about one-third of people complain of having an ‘aura’; this is a type of visual disturbance that varies in its extent and intensity and creates blind spots. An aura usually occurs prior to the beginning of a migraine and can serve as a signal to take timely precaution. 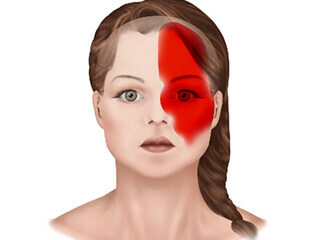 Approximately 15% of the world population is affected by migraines with women being more affected than men. It often starts with puberty, goes on to become worst during middle-age and starts to become less common after menopause in women. Migraines are thought to be due to a mixture of environmental and genetic factors with about two-thirds of the cases having a family history. They are believed to be a result of abnormal brain activity leading to temporary alteration in the brain signals, chemicals and blood flow. Some of the potential triggers for migraines include the following: allergies, low blood sugar, physical or emotional stress, bright or flickering lights, loud noises, temperature changes, strong smells or tension headaches. Other triggers could be dehydration, alcohol, hormonal changes such as with the menstrual cycle, menopause or birth control pills. Certain foods containing tyramine, MSG or nitrates can also lead to migraines. The irony is that avoiding these triggers doesn’t always mean one can escape a migraine and the triggers themselves don’t always produce a migraine either. To rule out other conditions, the doctor might order an initial EEG, MRI or CT scan. As there is no exact treatment for migraines, the focus is on prevention along with some lifestyle changes including avoiding stress to reduce the incidence of these migraine attacks. Commonly given medications include painkillers in combination with caffeine, anti-vomiting and anti-depressant pills. Of recent, intranasal and injectable medications are being prescribed for faster relief. And when nothing else works, neurological surgery to decompress the pressure on the extracranial sensory branches of the trigeminal and cervical spinal nerves can be performed to stop migraines in such ppatients. With the right management, it’s possible to live a full life even when there is a weakness towards migraines.